Jeff and I spent last Saturday checking out some sights in Trier and then the evening with friends in a winery gasthaus in the town of Mehring on the Mosel River. Trier is the oldest city in Germany, founded around 16 B.C. and, according to some historical documents, a settlement may have existed here as early as 2000 B.C. The city sits on the shores of the Mosel River near the western German border shared with Luxembourg. Because of its location, Trier, over the centuries, has been part of France, Prussia and Germany. Probably the city’s most famous son is Karl Marx, author of the Communist Manifesto, born here in 1818. The most famous sight in Trier is the Porta Nigra, an ancient Roman gate built around 200 B.C. The gate got its name from the black, sandstone used in its construction. Today the Porta Nigra sits at the northeastern end of the city’s main shopping street. Trier’s pretty, main market square. We’d received e-mails warning us of a protest in Trier during the days leading up to the weekend. Well, this is them. About a 100 young people protesting international anti-piracy laws. We couldn’t quite figure out what there is to protest about that. Overall, they were a very well behaved group under the watchful eye of a number of German Politzei. This is two of Trier’s main churches. On the left is the Cathedral of St. Peter, the oldest church in Germany, and on the right, the Liebfrauenkirche, Church of Our Lady. It’s quite interesting that these two churches ended up right next to the other. They are so close together they appear to share a common wall. Beautiful stained glass windows inside the Liebfrauenkirche. Almost right across the walk path from the Liebfrauenkirche is the Weinstube Kesselstatt. It’s a great place to sample the local wines and some excellent German faire. This huge press is inside the Kesselstatt. Nice little tray of German delight. We’re just south of Bitburg so the beer is an obvious choice, plus a couple of different Riesling wines. Here’s the home of Karl Marx. A plaque on the wall of Karl Marx’s house shows that he was born 5 May 1818. Interesting, 5 May, Cinco de Mayo!! I bet old Karl was quite the party animal with a 5 May birthday. Oh yeah, 5 May, Jeff’s birthday too. The Constantine Basilica in Trier built around 300 A.D. Nice barn shaped building with little cross on top. Hope they didn’t pay the architect for this design because I don't think they got their moneys worth. On the south side of Trier are these ancient Roman baths built in the 4th century A.D.
Front side of the Roman baths. Near the edge of the city is this Roman amphitheater built around 100 A.D. 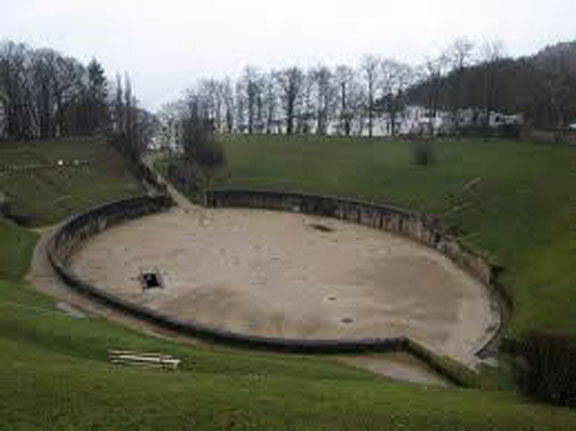 Originally, this amphitheater was incorporated into the city wall. There’s an interesting story of the city under siege by a hoard of barbarians. The Romans opened the amphitheater gates allowing the hoard to pour into what they expected was the city. However, they found themselves on the floor of the amphitheater with the opposite gates locked tight. Above, along the rim of the amphitheater, where Roman archers who proceeded to decimate the barbarian forces. OK, we’re done with our visit to Trier and on our way to Mehring. Driving along the Mosel in the late winter, without the leaves of the vineyard vines, these thousands and thousands of wooden stakes really standout. When you see the vineyards like this you can understand why WW II aviators feared bailing out over these vineyards with the possibility of being impaled on one of these stakes. Our destination in Mehring, Sebastiani. Sebastiani has a long affiliation with the US Air Force in Europe. He sells his wines at the major bazaars in Germany, Ramstein and Spangdahlem. For years, he’s made specialty labels for his bottles of wine. Here’s a label he made for the 53rd Tactical Fighter Squadron, an F-15 Eagle squadron stationed at Bitburg Air Base. The 53rd no longer exists and the last remnants of Bitburg Air Base, grade school, BX and commissary will finally be closed within a few years. Here’s another specialty wine label that Sebastiani produces for the 81st Fighter Squadron, an A-10 Warthog squadron, at Spangdahlem Air Base. Sadly, the 81st will no longer exist in about a year. We tried all of Sebastiani wines. This one had a particularly interesting nickname, Angel’s Pee. I’m not sure if that name creates images of good or bad taste. Our host for the evening, Alfons Sebastiani. The next morning before we left, Alfons gave us a tour of his cellars. These are old wooden barrels but he also had stainless steel and fiberglass. Combined, this cellar holds enough wine to fill 60,000 bottles. Well the drive home was only 45 minutes from Mehring so we had plenty of time to rest up from a great night at Sebastiani's. These wine events are a lot harder to recovery from compared to the beer events but maybe that's a nice problem to have. As far as we can tell there are only three operating monastery breweries still in Germany. They are, from north to south, Kloster Weltenburg, Kloster Sheyern and Kloster Ancechs; all in Bavaria. 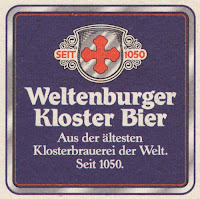 There are other breweries that were once associated with a monastery such as Tegernsee and Weihenstephaner (which is the oldest operating brewery in the world beginning operations in 1040) but, although the brewery still operates, the abbey, for various reasons, no longer exists and so they can't be considered a monastery brewery. 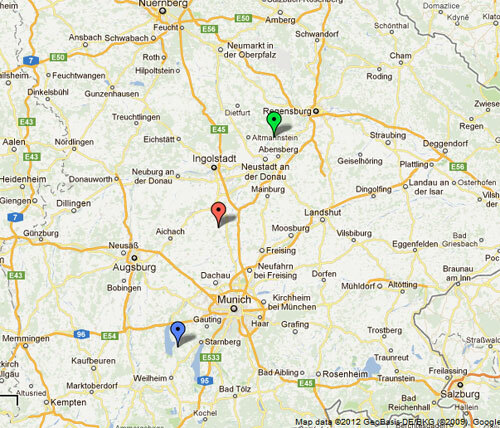 Below is a map that shows where these three monastery brewies are located in Bavaria. At the top you can see Nuremburg, in the upper right corner of the map is a gray line showing the Czech border, bottom right, Austria, and just northeast of the blue pin is Munich. The green pin is Kloster Weltenburg, the red Kloster Scheyern and the blue is Kloster Andechs. Kloster Weltenburg is situated on a peninsula in the Danube River just below the high granite walls of the Danube Gorge. 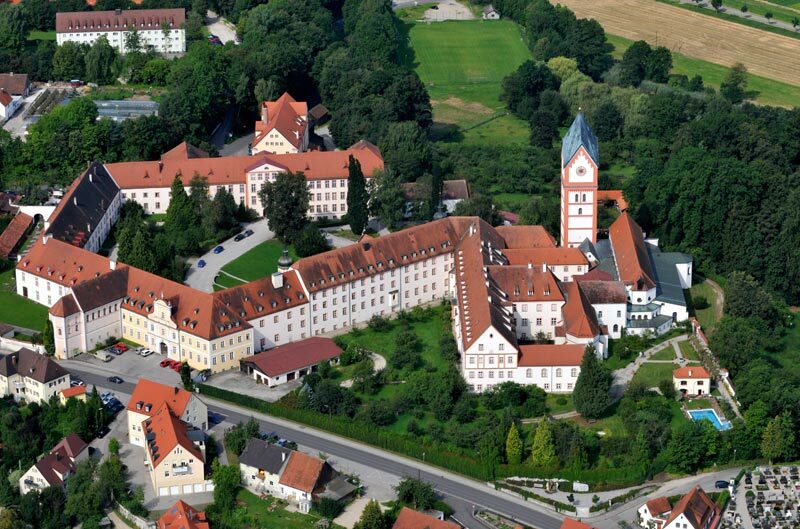 This Benedictine monastery was founded in 620 by Irish or Scottish monks near what is now Kelheim, Bavaria. 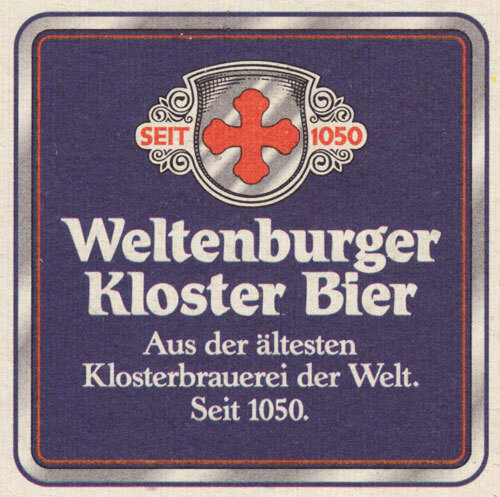 They began brewing operations in 1050 which makes them the oldest operating monastery brewery in the world. Weltenburg Kloster Barock Dunkel has been selected as the world’s best dunkel beer at prestigious beer competitions. If you happen to arrive at Weltenburg on the west side of the river you'll have to take a quite unique ferry across the Danube to access the kloster, there are no bridges for quite a few miles in either direction. The Kloster church is a magnificent example of Baroque designs built by the famous Asam brothers. Interestingly, one of the breweries best beers, which we have in our fridge right now, is called Weltenburger Asam Bock, a great doppelbock dunkel; double dark beer. A large beer garden courtyard serves the Kloster’s wonderful beers and Bavarian dishes and if the weather isn't agreeable they have a great gasthaus to serve all the same. You can see from the photo above that Kloster Weltenburg has a quite majestic setting which makes it a very special place to visit and an amazing place to sample some of Germany's best beers. Kloster Sheyern is a another Benedictine monastery in the Bavarian town of Sheyern. The monks began brewing beer in 1119 for their own consumption and some of the lucky local people. 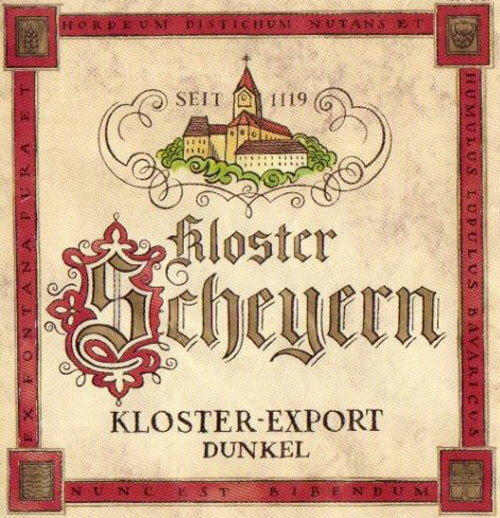 In the mid-1800's the monks moved their brewing operations to Augsburg but in May 2006 the monastery’s newly renovated brewery began operating once again on the premises of Kloster Sheyern. 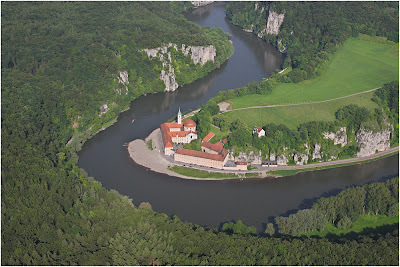 Scheyern was considered the monastery of the Wittelsbach royal dynasty who swayed power in Bavaria from 1180 to 1918. Today Kloster Scheyern, in addition to a monastery and brewery, also houses a vocational high school. Plus, if you notice in the picture above, the monks have a pool too. Above, you'll see the empty square by Kloster Scheyern. No check there because we haven't been here . . . yet. It's on our list for this summer. I'm sure we'll let you know about it right here on our blog. So all we know about Scheyern is the pictures we've seen on the Internet and what we've read on their web site. 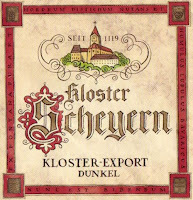 We haven't met anyone that's actually visited Kloster Scheyern either. But, from the pictures it looks like a great place to visit with a very nice beer hall and beer garden. 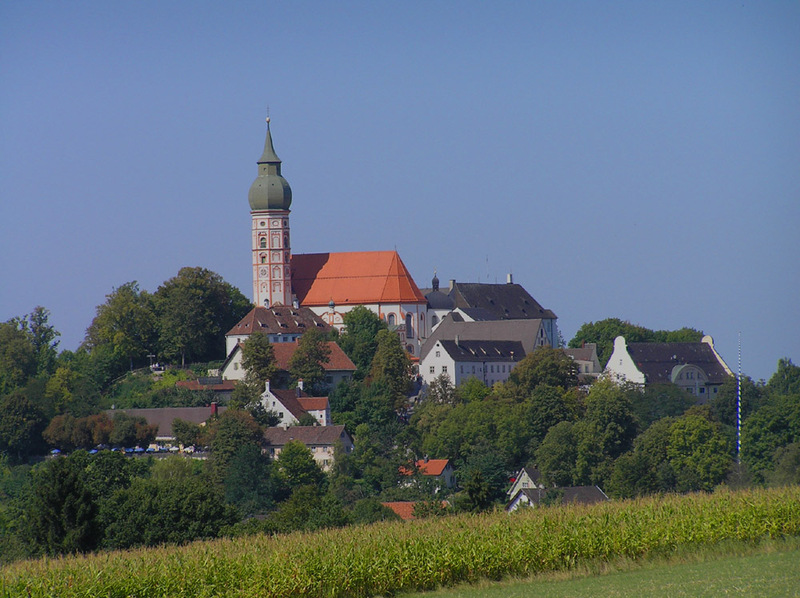 Kloster Andechs is situated on a hill that has become known as the Holy Mountain. This Benedictine monastery has been brewing beer since 1455 and, by many accounts, their Kloster Andechs Doppelbock Dunkel is the best beer in the entire world. The Kloster is located in the town of Andechs on the eastern shore of the Ammersee just a half hour drive southwest of Munich. Originally, a castle sat atop the hill but that was leveled in 1080 because of an assasination and much political intrique. Today, the interior of the abbey church, which dates from the mid-18th century, is another example of amazing Baroque designs, much of it decorated in shiny white porcelain. Kloster Andechs has a large, dark wood, typical Bavarian beer hall for inside eating and drinking, a big outdoor sun deck where you can sit and see the Alps on a clear day and, part way down the hill, a very nice beer garden. With all that is some of the best beer in Germany, an maybe the world, and certainly the best schwein hax'n eaten to date. We've been making pilgrimages to Kloster Andechs for almost twenty-five years now. It's one of our favorite locations in all of Germany. That little phrase on top of their logo says, "Food for the body and soul" and we'd have to agree because everytime we leave Kloster Andechs we're always very happy and quite full. Along the highways in Germany, the autobahn and secondary roads, you’ll see these white and black posts. They're a plastic road edge marker and because they’re along all the main roads there are millions and millions of them throughout Germany. Americans have affectionately named them Macht Nichts (mokt nix) Sticks. Macht nichts means it doesn’t matter or it makes no difference. In reference to these posts, they’re macht nichts because if one is taken out or run over by a passing vehicle it’s no big deal, there’s another one just down the road. So, they’re macht nichts sticks. Here's a little video with Jeff's explanation about the macht nichts sticks. Jeff and I happened to find a dead macht nichts stick, just laying there on the edge of the road, back in December while Kelly was visiting. We figured it'd be a great souvenir that would look good standing near our pool in Texas. So we devised a clandestine operation to pick it up. The plan required three people; one to drive, one to make the pickup and one to document the event. Here's a daring black ops, right here in central Germany. The macht nichts stick weighs almost nothing, other than the metal foot that attaches the post to the base anchored in the ground, as mentioned, it's a hollow, plastic post. Now, the trickest part of any foreign abduction, getting it out of the country undetected. We had a bit of snow the last week here in Germany and with that comes the inevitable salt on the roads. The snow was just enough to make things messy as the day warmed up and because of that most of the cars now had a nice coating of salty crud. So last Sunday I drove down to the local gas station to run my car through the car wash. The key word there is Sunday. I already knew that Sundays, by law, are a noise sensitive day but I didn't think it applied to something as quiet as this car wash, which, oh by the way, is a drive in, doors close, wash car, doors open, back out and leave, so in reality, a no noise operation. But, silly me, we're in Germany. 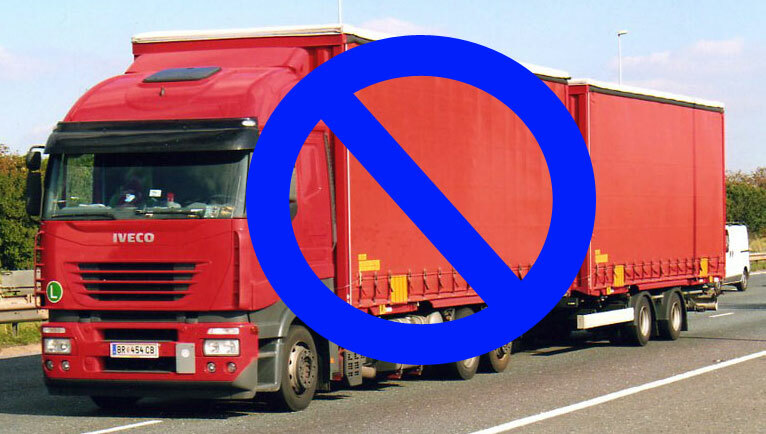 The big Sunday noise law is the ban on long haul trucks on the autobahn and secondary roads. Truck drivers have to park their trucks wherever they might be at midnight Saturday and can't move them again until midnight Sunday. The autobahn rest stops and big roadside gas stations become a huge truck parking lot on Sundays. Of course, this is an issue for countries that border Germany too because now, along the borders trucks must stop and wait to enter the country on Monday. Mowing your lawn is strictly verboten on Sunday here in Germany. 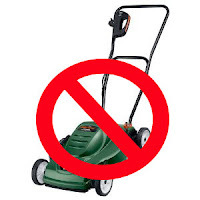 With noise reduction laws on Sunday a gas powered lawnmower is certainly an obvious criminal but the restriction goes beyond that. Even electric lawnmowers, which are popular here and make about as much noise as the typical house fan, are not to be used. 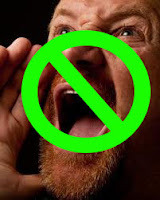 Should you violate this noise restriction, even with your quietly purring electric mower, at the very least you'll get a quite obvious disdainful look from the German folks walking by or, more likely, one of them is going to tell you of your extreme misdeed. I'm pretty sure loud talking is banned in Germany on Sunday. Come to think of it, we have certain friends, based on noise, that would be banned in Germany on Sunday . . . Goof. You don't dump your recyclable glass in the town's central collection points on Sunday because of the noise. You don't vacuum out your car on Sunday. No hedge clippers on Sunday. No noise on Sunday, damnit!!!!! When it comes to a German Sunday, just don't annoy anyone with your noise and you should be OK.